Special counsel Robert S. Mueller III has blown the lid off the “Russiagate” scandal. In a 37-page grand jury indictment filed last Friday, Mueller charged 13 Russian nationals and three Russian businesses with an elaborate conspiracy to defraud the United States aimed at disrupting the 2016 presidential race. At the intersection of law and politics, it doesn’t get much bigger than this. Since news of the indictment broke, every interested party on the planet has worked hard to spin the story—from President Trump and Russian Foreign Minister Sergey Lavrov to the talking heads on cable news and the nettlesome trolls who haunt your favorite websites. 1. Russiagate isn’t a hoax. Until the indictment, the official position of the White House and the president’s Fox News echo chamber—and even some pundits on the left and independent groups—was that there was no proof whatsoever to the claim that Russia or individuals acting on behalf of the Russian government attempted to intervene in the 2016 election. The scandal was trivialized as a hoax or fake news, or worse, a witch hunt and a new form of McCarthyism designed to discredit Trump’s victory. On the right, advocates of this viewpoint were motivated by a desire to defend Trump at all costs because they supported his positions on immigration, hostility to the media, rolling back voting rights and the social safety net, accelerating mass incarceration, dismantling Obamacare and redistributing the nation’s wealth even more obscenely in favor of the super-rich through a combination of tax cuts and economic and environmental deregulation. Skeptics on the left were understandably leery of alleged Russian intervention because of the hypocrisy and lies the country has been fed for years about foreign policy and the threat of terrorism by the intelligence community (the federation of 17 agencies, including the FBI and CIA, responsible for monitoring and protecting national security). Some elements on the left also were doubtful because of their opposition to the destructive economic and social consequences of neoliberalism as a governing philosophy, as represented by the Clintons and the dominant corporate wing of the Democratic Party. Both groups of skeptics argued that if there were any substance to the theory of Russian intervention, we would have learned the details by now. It wasn’t enough for either group that emails from the Democratic National Committee or from Clinton campaign manager John Podesta Jr.’s personal account wound up being published by WikiLeaks. The skeptics countered that the DNC’s emails were leaked from the inside rather than hacked from the outside. The new Mueller indictment undermines the skepticism. It lays out in meticulous detail the allegation of a conspiracy to “sow discord in the U.S. political system” through a variety of means, including, but not limited to, the creation and use of false and stolen social media accounts on Twitter, Instagram and Facebook, and the opening of bank accounts based on Social Security numbers stolen from unsuspecting Americans. Although the conspiracy began in 2014, the indictment charges that ultimately it was directed at helping Trump win the 2016 election. The defendants are accused in eight counts of the crimes of conspiracy against the United States in violation of federal election laws that prohibit foreign influence; wire and bank fraud; and aggravated identity theft. The specific overt acts the defendants allegedly undertook in furtherance of the conspiracy are meticulously laid out in the indictment one by one, paragraph after lengthy paragraph, perpetrator by perpetrator, deed by deed, date by date, place by place. Mueller and Deputy Attorney General Rod Rosenstein—the special counsel’s Justice Department supervisor, who announced the indictment at a Friday afternoon news conference—believe they can prove each and every allegation beyond a reasonable doubt in a court of law. Although the chances are virtually nil that the defendants will ever be extradited, the indictment is clear and precise, and by no means the product of a hoax. 2. Although the indictment does not charge Trump and members of his inner circle with criminal conduct, it by no means clears them. 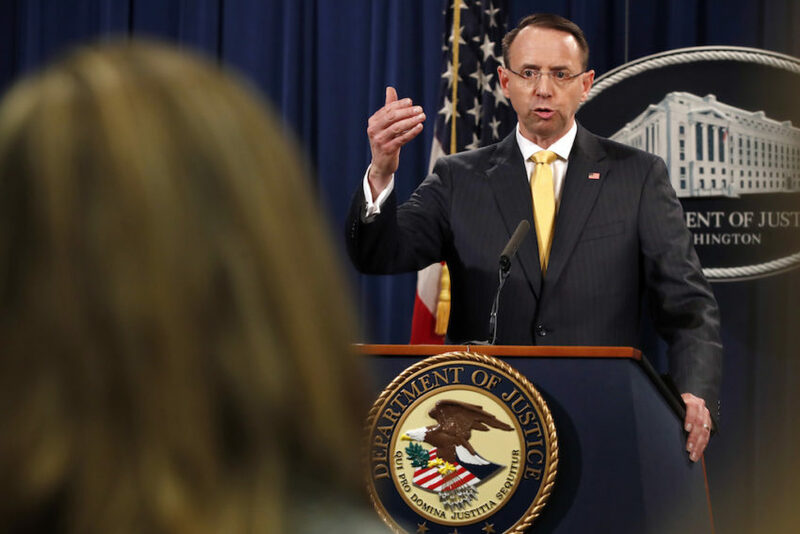 In his news conference, Rosenstein emphasized that no Americans were named as defendants in the indictment. Under the terms of the indictment, he explained, no Americans are accused of “wittingly” or “knowingly” participating in the conspiracy. On the heels of the news conference, Trump and his supporters have seized on Rosenstein’s remarks to claim that the indictment clears the president and his campaign of any charges of colluding or plotting with the Russians. The truth—always an elusive commodity in the hands of the 45th commander in chief—is that the indictment is silent on the criminal liability of any Americans. It does not prove there is no liability. We know this because Mueller also disclosed on Friday that he and his team had secured a guilty plea earlier this month from a California man named Ricky Pinedo on charges of identity fraud for using stolen identities to set up bank accounts that he later unwittingly sold to the Russians to facilitate their social media mischief. Nowhere is Pinedo, who has entered into an agreement to cooperate with Mueller, mentioned in the new indictment filed against the Russians. It is simply wishful thinking on the president’s part to conclude that additional Americans, including some possibly linked directly to the Trump campaign, won’t be subsequently prosecuted. Trump and his minions also seem to have forgotten, or wish the rest of us have, that Mueller also has secured guilty pleas from two other former Trump advisers—George Papadopoulos and Gen. Michael Flynn—for lying to the FBI. Like Pinedo, they have promised to cooperate with Mueller in his ongoing probe. In another late-breaking development, former Trump adviser Rick Gates is expected to plead guilty to money laundering charges, and agree to testify against ex-Trump campaign manager Paul Manafort in a trial slated for early May. As such cases illustrate, the Mueller investigation as a whole is concerned with far more than Russian efforts to disrupt the elections by infiltrating social media platforms. Most critically of all, the investigation is focused on the president’s personal liability for obstruction of justice stemming from the May 2017 firing of former FBI Director James Comey, and possible money laundering involving his business dealings with Russian interests both here and abroad. 3. The indictment does not prove the election was stolen from Clinton, but neither does it establish the opposite. As the old saying goes: “Even a broken clock is right twice day a day.” In at least one respect, Trump was correct in asserting in a weekend tweetstorm on Mueller and the FBI that nothing alleged in the new indictment shows the conspiracy affected the outcome of the election. In his news conference, Rosenstein made the same observation, although without the histrionics. Still, nothing alleged in the indictment will lift the cloud of illegitimacy that has surrounded the Trump presidency. In all likelihood, the indictment will have the opposite long-term effect, as it alleges that the Russian disinformation operation managed to reach millions of Americans. The election was decided by under 78,000 votes in the swing states of Pennsylvania, Wisconsin and Michigan. Clinton may have been the worst candidate the Democrats could have nominated, but had she prevailed in all three, she would have won the Electoral College by a tally of 278 to 260. 4. For the moment, Rosenstein and Mueller are safe. Since his appointment, Mueller has been a constant thorn in Trump’s side. According to The New York Times, he threatened to fire Mueller last June, when stories first circulated that Mueller was looking into the obstruction issue. Trump reportedly stopped short of giving the termination order only because White House counsel Donald F. McGahn II threatened to resign. It’s also no secret that Trump distrusts Rosenstein. Because Attorney General Jeff Sessions recused himself in March 2017 from overseeing the Russia investigation, Rosenstein is Mueller’s boss. Under the law, only Rosenstein has the authority to carry out a presidential order to fire Mueller, and he may do so only for good cause. Should Rosenstein refuse, Trump could fire him or force his resignation, and command the official next in line in the Justice Department’s hierarchy to get rid of Mueller. With the impending retirement of Associate Attorney General Rachel Brand, the task would fall to Solicitor General Noel Francisco, whose basic responsibility is to represent the administration before the Supreme Court. Francisco is a movement conservative long affiliated with the Federalist Society. It’s by no means certain that Francisco would agree to fire Mueller, but if he did, he would follow in the footsteps of Robert Bork, who as Richard Nixon’s solicitor general fired Watergate Special Prosecutor Archibald Cox in the infamous “Saturday Night Massacre” of 1973. Whether by design or not, the new Russia indictment, with all the details it sets forth, should stave off a repeat of the massacre—but only for the time being. With Mueller negotiating with Trump’s attorneys to set up a face-to-face interview of the president under oath, anything could happen in the coming months.